There are updated test viewers available on the SourceForge Kokua project site. For those unfamiliar, LindenLab has Project Alex Ivy in progress. Alex Ivy updated Windows and MacIntosh SecondLife viewers to 64 bit and for Windows kept a 32 bit viewer. SecondLife Alex Ivy has progressed from white-board to Project Viewer and now is a Release Candiate viewer. to wait until LindenLab developed upstream. We now have Windows and Mac 64 bit Alex Ivy viewers available for testing and feedback. These viewers should contain functionally at par with current SL default viewers. We recommend testers focus on, but not be limited to, notifications and taking and processing snapshots as those areas caused the most problems during the recent merge. Kokua Linux viewers do not yet have the Alex Ivy code base. At the last Linden Lab (LL) Third Part Viewer (TPV) meeting, LL recommended that TPV projects merge updated SSA code in anticipation of planned pile on testing of the updated inventory code known as AIS V3. AIS V3 is a new inventory Application Programming Interface (api) developed to correct inventory handling issues discovered during tests and roll out of SSA. Also, LL recently removed client baking code and that code is dead from LL’s point of view. 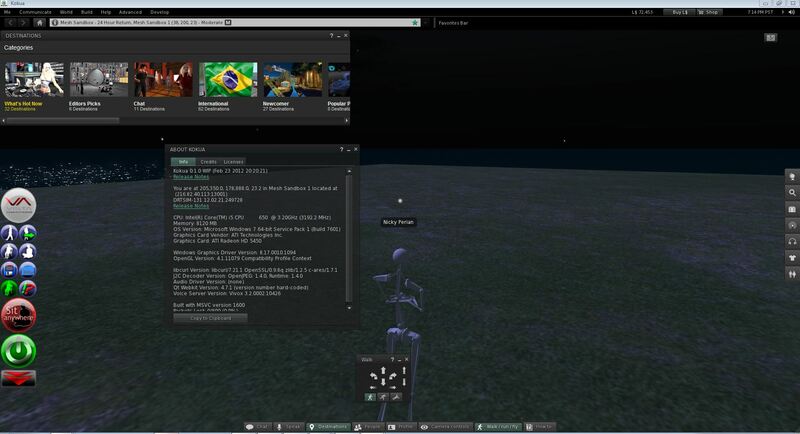 Kokua is also used as an OpenSim (OS) viewer and lack of client baking would disable the viewer for many of our users. Kokua has built test viewers for Windows and Linux 64 bit platforms that can be used for the upcoming LL pile on test and have the client baking code restored for use on OpenSim grids. There are four regions on aditi beta grid that have server code with AIS V3 activated. Regions sunshinesls, sunshinesls1, sunshinetest, sunshinetest1 are the AIS V3 test regions. The code repository and issue tracker are on Bitbucket. Please read repository issues for updates on problems and known limitations. The downloads are on Sourceforge. This test viewer affects your inventory. Please review our best practices before testing. Tests by primarily SL users should be on aditi and be focused on inventory transactions including changing avatar body parts and body part parameters for example eye color. Tests by primarily OS users should be similar and include looking for any changed behavior from the latest release viewer. If any Kokua user wants to take part in LL’s pile on tests please let me know via email. Kokua added to Linden Lab Third Party Viewer list. On Tuesday April 24, 2013 we received notice that Kokua was now an approved Third Party Viewer. The Kokua TPV page is linked here : Kokua added to Linden Lab Third Party Viewer list. Above you’ll find a little tease of what’s coming down the pipe. Can you spot what’s significant in this screenshot (Hint check the image url)? First and foremost, please don’t be asses […] listen to your end users, do the respectable thing and listen to what your end users want and need, and in a timely fashion [Experimental Builds]! It brings up a good point though, in that it’s important to listen to what your users want. Granted sometimes there are things we just don’t have the manpower to do. Ideally we’d love to make a viewer every month with a completely revamped UI that is fully customizable and adjusts to a users tastes (Are you a builder or a shopper, a dancer or a socialite, a machinima maker or a sailor etc). Unfortunately there are limits to what we or any developer can do, but we’ll try to work out what’s best and try things from time to time. Experimental builds are a great step along this line, as suggested be several people, as it allows the public to test out new viewers before they’re really “ready” and give us feedback, allowing us the opportunity to make changes to things before we put too much time into them and it’s too hard to change course. And so we’re going to try to release more test viewers, starting today. We’ve set up a special page on the wiki were we will post test viewers as we can, they may or may not be announced here on the blog. Please understand that these are not Beta viewers but Alpha viewers and are generally only tested internally. We’re going to make an effort to put more of them up on the blog though. They may not be available for every platform (ie it may be only Linux 64 or Windows 32 and nothing else). But if you want to see what’s “brewin in the pot” this is one way you can do it, just be sure to read the instructions on the page and take whatever necessary precautions are recommended (This is the knife’s edge folks, you have been warned). Luke Hillman, a student at Georgetown University, is conducting research about SL third-party viewer usability as part of his master’s thesis. He’s currently running an online survey for SL users. This survey is targetted specifically at SL users, so if you use only non-SL platforms (e.g. OpenSim), please refrain from taking the survey. The survey takes about 20 minutes, and has questions about how you use SL, and how easy or challenging it is to do specific things in your primary viewer of choice. If you have some time to take the survey, it would help Luke with his research! Luke will also be conducting inworld interviews and a focus group as the next phases of his research. If you would like to be considered for participation in those, you can provide your email address at the end of the survey, or email lsh25 at georgetown.edu or contact Jaime Radium in SL. This past Wednesday, September 1, was the second anniversary of the launch of the Imprudence Project! We are having a multi-grid party this Sunday at noon PDT (19:00 UTC) to celebrate the occasion! The event will be held simultaneously in 3rd Rock Grid at the Hoagie region, and in Second Life at the Rouge region. Many thanks to CodeBastard Redgrave for taking care of the preparations! We’ve seen many new users trying out Imprudence over the past few weeks. Welcome! You’ll find that Imprudence has many of the features you’re used to, though not always in the same place as in other viewers. We’re also adding new features all the time; as McCabe mentioned in his recent post, we will have spellcheck, translations, right-click copy and paste, and many other highly-requested features in our upcoming weekly experimental builds. We are aware that some users have been experiencing problems with performance, stability, connecting, or media playback (among others). Unfortunately, there are a huge number of factors that affect the viewer (operating system, hardware, drivers, etc. ), so it may run perfectly for one person, yet not at all for another. Please be assured that we’re watching the forums closely, and are working to fix the problems you report. We know these issues can be frustrating, but we ask for your patience, as our resources and manpower are limited. If you experience a crash or other problem, you can help us fix it by emailing us your log files along with a detailed description of the problem. I’d also like to give a big thank-you to everyone who has been helping out in the forums by welcoming new users and answering questions. We really, really appreciate it! I’m very excited to introduce two new additions to our team: CodeBastard Redgrave (aka Codie) and Elektra Hesse! Codie is our new community liaison. It’s her job to assist users, answer questions, gather feedback, and make sure we never lose touch with our users. She’s also the voice behind @imprudence on Plurk, and @ImpViewer on Twitter — follow them for announcements and tips in your timeline! Elektra is our new Mac developer. She has extensive experience developing software for Macs, and already has several excellent ideas for making the viewer experience even faster and nicer for Mac users. We’re very excited to have her, and look forward to working with her to improve Mac support! A lot has happened in the past year, but one particularly tumultous (yet ultimately fortuitous) event stands out as being the most significant in Imprudence’s history. This past March, Linden Lab announced a new policy governing third-party viewers like Imprudence. For a time, it seemed we would be unable to support Second Life any more. Fortunately, Linden Lab revised the policy, so that we were able to resume supporting Second Life — but by then, we were already immersed in OpenSim. We toured a variety of OpenSim-based grids, and settled in to a new home on 3rd Rock Grid, where we meet each week to discuss development progress. Although we still support Second Life, and many of our users connect to it, our primary focus is on OpenSim. We’ve added several features that are only available on OpenSim, such as LightShare (server-side, scriptable Windlight settings) and the ability to create and edit megaprims (prims larger than 10m) and microprims (smaller than 0.01m). If you haven’t ventured outside of Second Life yet, we encourage you to visit one of the OpenSim-based grids available in our built-in Grid Manager, or any of the many other grids waiting to be explored. We’ve gotten a lot of questions about what we’ll be doing in the future. Some people wonder about specific features or changes that they are interested in. Others are curious about our broader plans. Our immediate goal is to finish Imprudence 1.3. This version has been in development for over 9 months, far longer than we ever anticipated. This long development cycle is due to several major events causing us to adjust our plans and priorities, and also due to our eagerness to create a viewer that is stable, usable, and useful for as many people as possible. Thankfully, we’re getting very close to a final release now: RC2 came out last week, RC3 is coming soon, and the final release should follow soon after. Because we are so near to the release, we are no longer adding new features to 1.3, with a few exceptions (most notably, the ability to choose from several available fonts). This means that there are many features that will not appear in the 1.3 final release, but they will continue to be available in the weekly experimental builds, and eventually incorporated into 1.4. Imprudence 1.4 will be a much shorter development cycle than 1.3. One of our focuses for that cycle will be to adjust our project organization to allow us to keep working smoothly as the project grows. We’ll also be cleaning up the compile system, to make it easier for more people to contribute to Imprudence. We are also considering a donations system, but we want to be certain that it is done transparently, with all donations going towards specific project-related goals. We welcome your feedback and suggestions about the best way to do this. The viewer itself will also see plenty of changes in 1.4. We’re hoping to completely replace the current media system, which has been a major headache both for us and for many of our users. Naturally, there will also be plenty of other improvements and feature additions, such as support for multiple wearables, multiple attachments, inventory links, and shared media. Plus, of course, all the things that didn’t quite make it into 1.3, like spellchecking and translation. Looking towards Imprudence 1.5, our plans are still quite loose and tentative. One solid proposal is to investigate migrating to the Viewer 2 code base. This task would involve a lot of effort in revamping the UI to address the many complaints that have been raised about the Viewer 2 UI, as well as forward-porting the improvements and features that Imprudence has accumulated over the past two years. It would not be an easy job, but we believe migrating to the Viewer 2 code base will give us a more solid foundation for improvement and innovation in the future. Beyond that, we can only dream and speculate about the future. One thing’s certain, though: it will be quite a ride. Here’s to another year of Imprudence! Just a reminder that we’ll be having our weekly Impdev meeting in InWorldz today at 12:00 PM PDT (19:00 UTC). The Inworldz people have been nice enough to set up a region for us at Imprudence/143/135/22. So far our OpenSim Grid Tour has been very productive and great fun. Hope to see you there! You are currently browsing the Kokua/Imprudence Blog weblog archives for the Highlights category.